you can request with the idea Create YOUR Warangel. The brand new map of Attica of Spartans, to recreate the Battle of Termophili pass, the passage between sea and mountains on the North. On the right the plain of Marathona and the Radioactive Cloud of Athen. 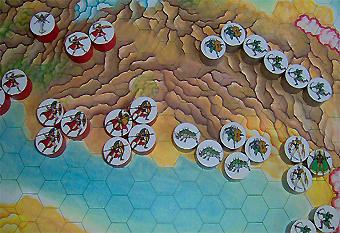 Same Map seen from the North, to close up the Termophili pass, where Leonida is ready to impact the Shythed Rhinos of Persians. Serse is on the right, well protected by gigantic Abominiums and his pletora of Archers. 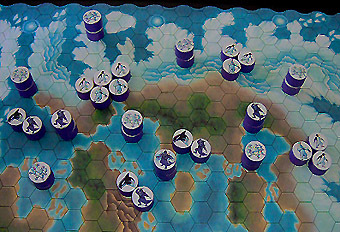 Leonida and his faithful Spartans, protected by their Brozen Shields, face the Impact. 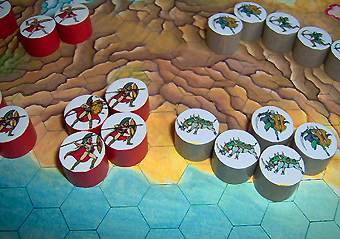 On the North the elite corp of Immortal Persians pass through the mountains to sorround greek's army. Polars, 2nd Generation on their hexed map representing Baffin Bay, a territory with plenty of ice and water hexes, both specialization zones of Walruses, KillerWhales, Polar Bears and Penguins that compose this race, really powerfull but deeply linked to the map. On maps like this, Polars are outstanding; it is much more difficult to move and lead them on other maps with deserts, mountains or lava. 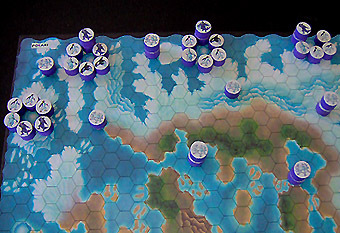 A close-up showing Polars blocking 4 Blue Holes of their map, a good choice to defend that sector and also good for being ready to invade other maps from those dimensional passages. Here is a tipical defensive placement. Polars are in the middle of their map, leaving all dimensional passages free. 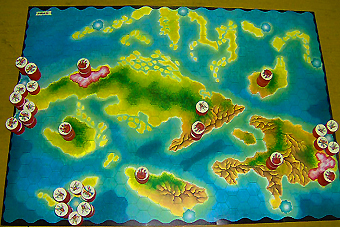 In this way they attract opponents to their map where the Polars are favoured by their double specialization water-ice. Iceland map, rich in volcanoes, and the home land of Valkiries, 3rd Generation. Lava rivers are impassable obtsacles for warriors that, out of water, can only crawl, just like KillerWhales of the Polars, while Valkiries, transported on their Dragons, easily fly over these hot rivers. Also the Vulcanoids, precious allies of the Valkiries, and mutants with a lava exoskeleton, do not suffer wounds when crossing lava rivers. 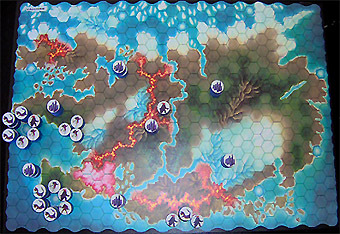 Note the lower Blue Hole: to block this one, adjacent to the map border, three warriors are enough: two Vulcanoids and a Dragon. It is important "read" the maps and see Blue Holes that are easy to block. 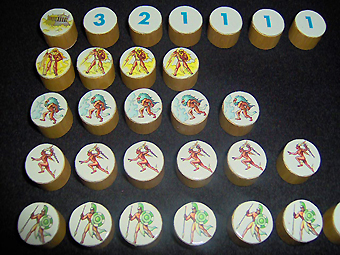 For example the two Holes on the left requires six warriors each to be blocked. It is up to you balance your forces: place your worriors in a sector of your map good for you and not good for your enemy. The Valkiries rightly avoided to put fortresses and warriors in the northern sector of their map that consists of ice, a zone that would provide a good area of attack for the Polars if they were facing them. Pirates, 6th Generation, on their Caribbean islands. Cuba is the biggest island in the middle, left Haiti, low Giamaica. With two aquatic transports like the Gigantic Muraenas and the superfast SailFish, Aras, wich are the supercoloured human-birds Pirates, have excellent way to move and play amazing attacks. 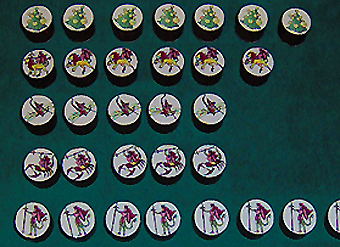 Chimeras, 9th Generation: 7 Fortresses, 1 Master, 5 Lion Chimeras, 5 Dragon-flyChimeras, 5 SkorpionChimeras, 12 She Soldiers. Two warriors in one: when the animal body is eliminated, their human side always survives in the form of a She-Soldier. 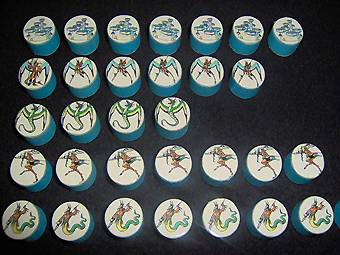 DragonWomen, 9th Generation: 7 Fortresses, 1 Master, 5 Dragonwomen, 5 Air Dragins, 7 Sea Dragons, 11 Dragonmen. 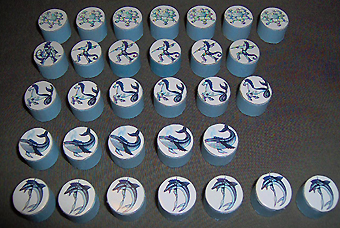 A race strong and complete: DragonWomen are excellent warriors who fight at best not in group but alone, Air Dragons are perfect for attacks, Sea Dragon may enchant with their human female beauty. Civilizers 10th Generation, 7 Fortresses, 1 Master, 3 Centurions, 6 Bicefalus Horses, 7 Slaves, 12 Legionaries. Near the Centurions, see the "Roads" this race can build to change maps on which they move. 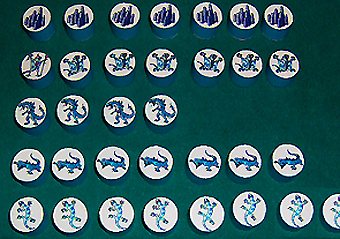 Gekoes, 11th Generation: 7 Fortresses, 1 Master, 6 Blue Gekos, 4 GodVaras, 7 Varanoes, 13 Gekoes. Blue Gekoes may glide from they gigantic GodVara that may transport them easily, like war towers. Gekoes are th eonly one that may stay on chasm, gripped along the vertical walls. Dogs, 11th Generation: 7 Fortresses, 1 Master, 5 Great Danes, 5 S.Bernards, 7 Dobermann, 11 Greyhounds. They can scent any hidden enemy. Whoever is hidden in a Fortress, underground, with its own counter turned face down to not reveal his identity may be discovered by Dogs. 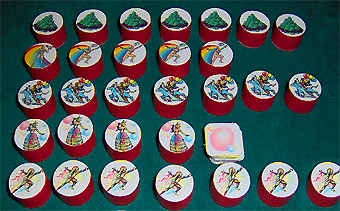 Colors, 11th Generation: 7 Fortresses, 1 Master, 6 Rainbowomen, 7 Clowns, 4 Mask, 11 Harlequins. The wonderful Rainbowomen simply take away from any enemy the will to fight. With their beauty and power of Colors they re-paint the world from darkness of war. 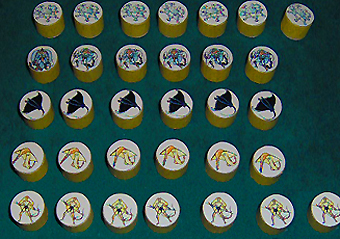 Insects from 1st Generation, Chelates from 2nd, Gladiators from 1st and Eagles from the 1st. 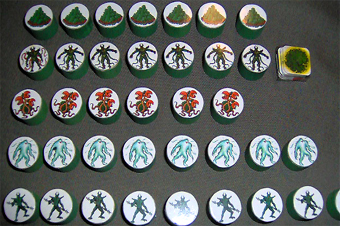 With Create YOUR Warangel you can choose your favourite Races from any Generation of the game. 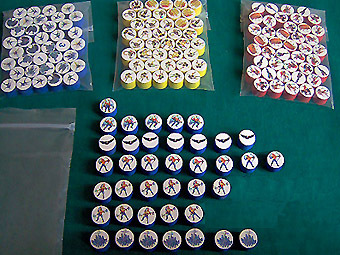 Each single Tournament Race you receive is packed in a plastic zip-bag like the ones you see in the pictures. 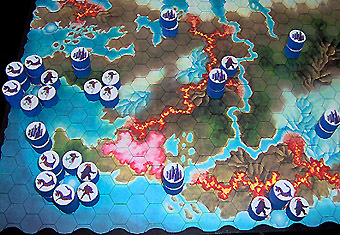 A detail of Eagles' Tournament Race. Now is easy to understand the numbers you see for the Eagles in the Tournament Races List: 5, 7, 8, 11. 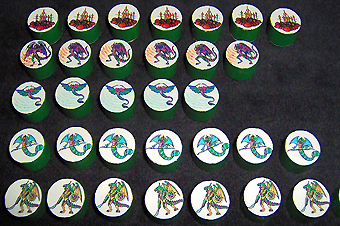 That means: 5 Eagles, 7 Condors, 8 Archers, 11 Hawkmen. Each formation always includes its own Master and 7 fortresses. 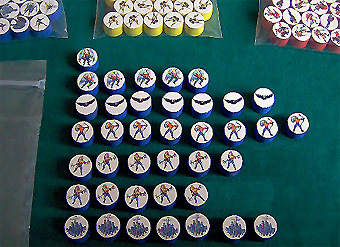 On the back of each fortress woodcounter, is pasted the number of Resource Points it contains. 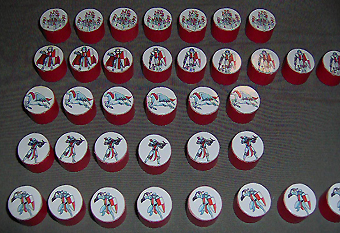 Ghosts, 1st Generation: 7 Fortresses, 1 Master, 4 Ghosts, 6 Vampires, 7 Skeletons, 10(11) Undeads. Why 10(11) Undeads? 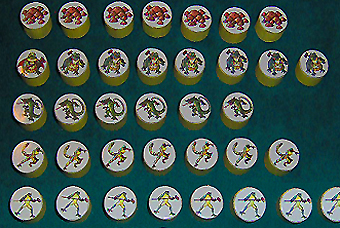 10 is the number of Undeads you can place at the beginning of each battle of this Race. Ghosts have the chance to capture the soul of the enemy they defeat in close combat. If this happens, they create a new Undead. Up to 11 warriors. 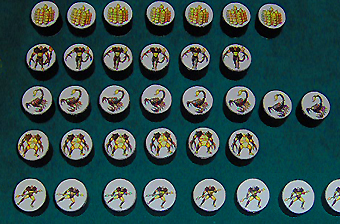 Chelates, 2nd Generation: 7 Fortresses, 1 Master, 5 Chelates, 8 Skorpions, 6 Crabs, 11 Acarides. Warriors with huge exoskeleton, among the hardest to kill among the Warangel Universe. On their Iraq's Map and in all desert scenarios, they are great because they can hide under the sand. 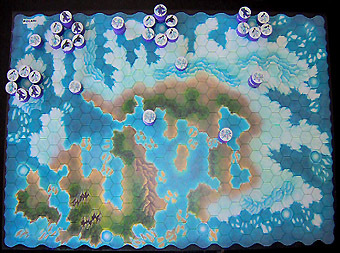 With semi-acquatic warriors like Crabs, this race also has good chances on water maps. 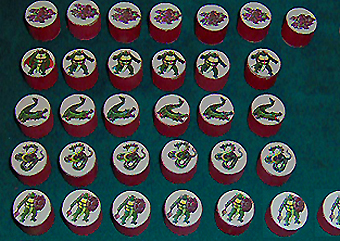 Reptilians, 2nd Generation: 7 Fortresses, 1 Master, 5 Turtles, 6 Crocodiles, 6 Anacondas, 6 Tortoises. 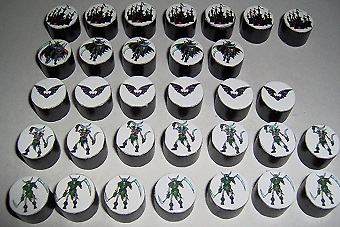 One of the most defensive armies, they are very well protected by their natural shields. Heavy and slow creatures. But Turtles have the gift of teleport, so they can play clever ounterattacks. 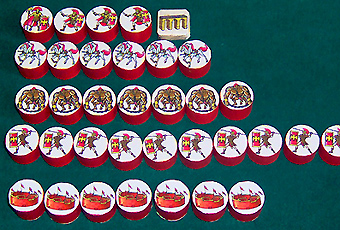 Templars, 3rd Generation: 7 Fortresses, 1 Master, 2 templars, 6 Winged Horses, 6 Crossbowmen, 12 Squires. Each Templar may generate on defence 2 Hologram Warriors that looks exactly like the real one. This means that on offence they are 1 Master and 2 Templars, on defence the enemy sees 3 Masters and 6 Templars. Will the opponent get the real ones? Amphibians, 3rd Generation. 7 Fortresses, 1 Master, 7 Toads, 6 Chamaleons, 7 Salamander, 11 Frogs. They hold with their slimy tongues and squirt acid liquids: one of best races in mixed maps with plenty of marshes. Their home map is delta of the Parana River, near Buenos Aires. Gods, 3rd Generation. 7 Fortresses, 1 Master, 3 Zeus, 5 Aeol, 6 Ermes, 12 Ares. Descendants of ancient Greek's Gods, this is one of the most mythological and requested army. Lighings of Zeus, Storms of Aeol that may sweep away more targets on a straight line, Ermes who may steal weapons from enemy... You'll have few warriors but plenty of chances. 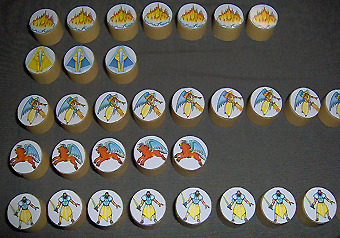 Masters, 3rd Generation: 7 Fortresses, 1 Absolute Master, 2 Masters, 9 Archangels, 6 Leotaurus, 10(12) Disciples. Masters are pure spirits that may incarnate in Archangels to upgrade their values. Archangels, with their Lightsabres, may enlight oponents and convert them in Disciples. Or reduce them in dust. Atlanteans, 4th Generation: 7 Fortresses, 1 Master, 5 Tritons, 6 Sea Horses, 5 Blue Whales, 12 Dolphins. Tritons control Blue Holes: they may choose the exit Blue Hole on enemy Maps. And teleport with them the Sea Horse or the Blue Whale they are riding. 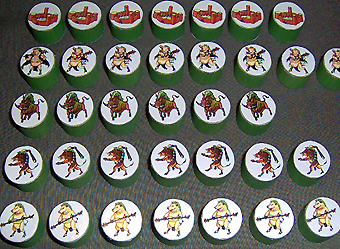 Porks, 4th Generation: 7 Fortresses, 1 Master, 7 Porks, 6 Warthogs, 7 Wildboars, 12 Pigs. 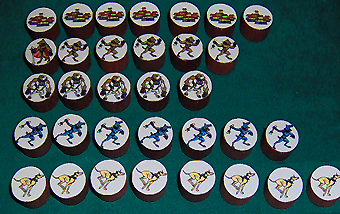 The Porks riding the Giant Warthogs forms one of the powerful terrain combo. Also Wildboars and Pigs may ride the giant "tanks"; tey all dive in the mud to be mimetized when are on marsh zones. Torpedoes, 5th Generation: 7 Fortresses, 1 Master, 5 Torpedoes, 6 Mantas, 6 Saw-Fishes, 12 Spiked Skates. The gigantic Mantas may transport Torpedoes, flying over waters like black war surfs. 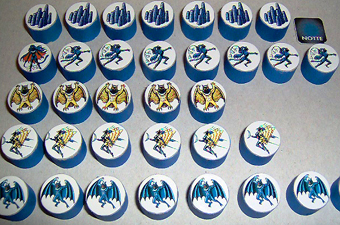 Nightlies, 5th Generation: 7 Fortresses, 1 Master, 7 BlackCats, 5 Owls, 6 Nocturians, 12 Bats. A "normal" race by day, a terrific race by night. 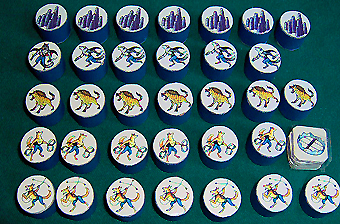 At the beginning of each turn they turn the counter "night-day": on night they gain excellent powers, like mimethism and much more. Hunters, 5th Generation: 7 Fortresses, 1 Master, 5 Wolves, 7 Hyenas, 6 Foxes, 11 Coyotes. 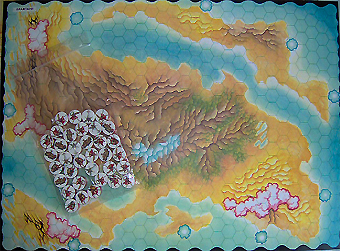 Wood, Ice, Mountains with Wolves and Foxes; Desert and Prairies with Hyenas and Coyotes: one of the races with most terrain specializations, excellent on their map of Wolf Creek in northern part of US. On the right see the "traps" that Foxes may leave on their path. Birds, 8th Generation. 7 Fortresses, 1 Master, 5 Albatros, 4 Quetzalcoatlus, 7 Ostrich, 12 Feathered Snakes. Normally, in Warangel, flyers may fly during their Movement phase. Before and after they are on the ground. Birds have Albatros and Quetzalcoatlus that may "stay in the air" during the defensive Phase, thanks to their gigantic wingspan, a great, unique chance.